Duane Maktima (b. 1954) - Laguna/Hopi Turquoise, Sugilite, Pink Coral and Sterling Silver Earrings c. 1993. 1.5" x 1"
Duane Maktima - Hopi/Laguna Gold and Silver Post Earrings, c. 1980s, 2" x 1"
Lyndon B. Tsosie - Hopi 14K Gold Asymmetrical Earrings with Coral and Labradorite, c. 1980s-90s, 1" x 0.75"
Mary Lovato - Santo Domingo Multi-stone and Shell French Hook Earrings c. 2000s. 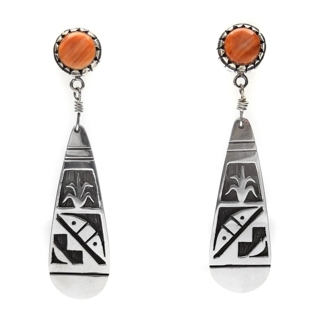 1.75" x 0.75"
Matthew Miranda - Acoma/Spanish Sterling Silver French Hook Earrings Stamped with 1930s Navajo Stamp Design, 1.75"
Navajo Multi-Stone and Sterling Silver Heart Design Post Earrings, c. 1980s-90s, 0.75"
Navajo Spiny Oyster and Sterling Silver Heart Post Earrings, c. 1980s, 1.25"
Navajo Sterling Silver Post Earrings, c. 1980, 1.375" x 0.875"
Oscar Betz - Navajo Turquoise, Spiny Oyster and Sterling Silver Post Earrings, c. 1.5" x 1.25"
Phillip Sekaquaptewa - Hopi Silver Overlay French Hook Earrings with Kokopelli Design, c. 1980s-90s, 0.875"
Santo Domingo Multi-Stone Inlay Shell Earrings with Spiny Oyster, Turquoise, Sugilite, Mother of Pearl, Jet, Catlinite and Serpentine, c. 1980s, 1.5"
Santo Domingo Sterling Silver Earrings with Multi-Stone Inlay of Turquoise, Jet, Spiny Oyster, Serpentine, and Mother of Pearl, c. 1980s, 1.375"
Zuni Multi-Stone and Sterling Silver Thunderbird Clip-on Earrings, 0.875"
Zuni Petit Point Coral and Silver Post Earrings c. 1980, 3.75" x 1.25"